Are you wondering what to do with all of those tomatoes in the garden? 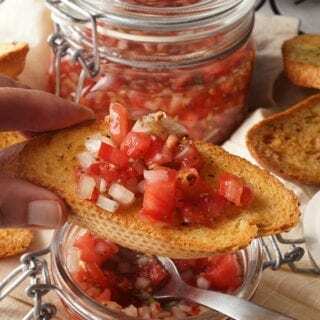 I have the easiest and most delicious recipe for you today – Homemade Tomato Relish! This is a recipe that has been in my family for years. It is actually my Great Grandma’s Recipe, but wait… I’m getting ahead of myself! 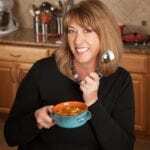 My name is Deb and my blog is Bowl Me Over. On my blog I share delicious recipes that often end up in a bowl, hence the name Bowl Me Over! Thank you Rini for sharing this recipe with your readers. 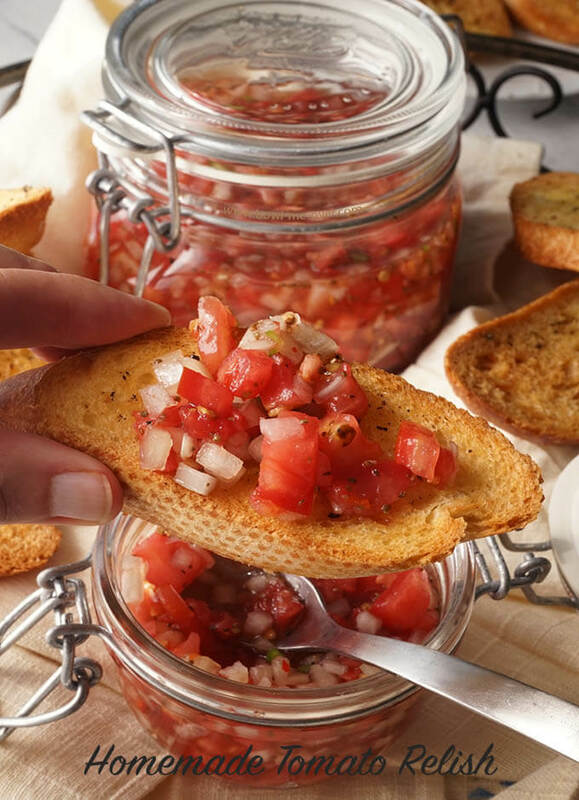 Homemade Tomato Relish will be your new favorite condiment! When my Grandmother passed away, my Aunt was kind enough to give me her old cookbooks and notes. What might look like tatters and notes to some, was a treasure trove of memories to me! As I was going thru this recipe, I originally thought it was my Grandma’s, but I didn’t recognize the handwriting. After searching thru more records, I realized this is my Great Grandma recipe. This recipe has been in our family for over 100 years! This homemade relish only takes about 15 minutes and will keep about 2 weeks in the refrigerator (if it lasts that long!). When I seen it, I thought this would be great recipe to share with Healing Tomato, don’t you agree? Delicious tomatoes, onions and peppers that is a POP of flavor! This recipes uses everyday ingredients that will give you an over-the-top new condiment! 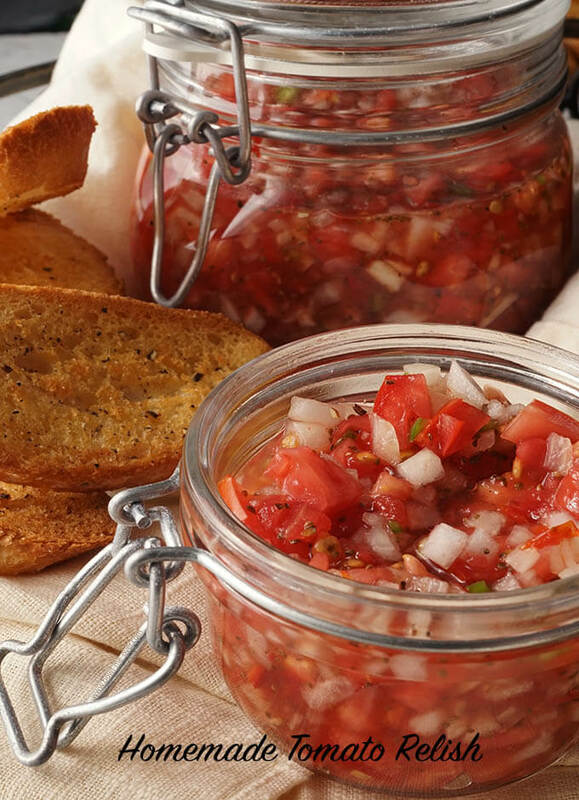 Tomato Relish will quickly become a new favorite! And trust me, you’ll want to double the recipe! I know this because the first time I made it…. we ate it all. So then I had to make it again and we ate it. In fact, I made it three times before I got a chance to photograph it, it’s that good! Store it in a pretty jar, old mustard jar or a canning jar – whatever you have that is handy! 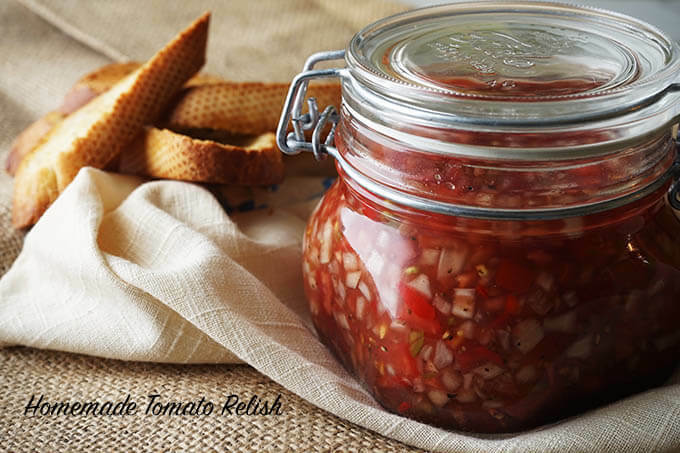 What will you use this delicious Homemade Tomato Relish on? Whatever you use ketchup or salsa on you can now replace with this amazing recipe! Toss it in macaroni salad for an extra added zing! Layer it on a toasted bagel with cream cheese, delish! Use it as a light salad dressing – it’s really has great flavor! Exchange tomato relish for pickles in potato salad – yum! Finish off a grilled veggie patty – everyone will be saying WOW that’s good! Better yet – enjoy with my Slow Cooker Mushroom Burger! Topping grilled vegetables will give them extra flavor. Add it to your Egg Salad to give an extra POP! I love old recipes you can still enjoy today! 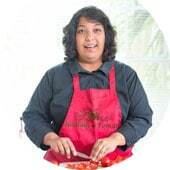 Tomatoes, onion, a Fresno chili pepper, celery seed, salt, pepper, sugar and vinegar – dice the tomatoes, onions and pepper finely – mix together with the spices. Screw the lid on tightly and let stand overnight and it’s ready to use. Having said that I waited about an hour before trying it – so there’s that! ? I’ve kept in the refrigerator for up to two weeks. I hope you enjoy this recipe for Homemade Tomato Relish! 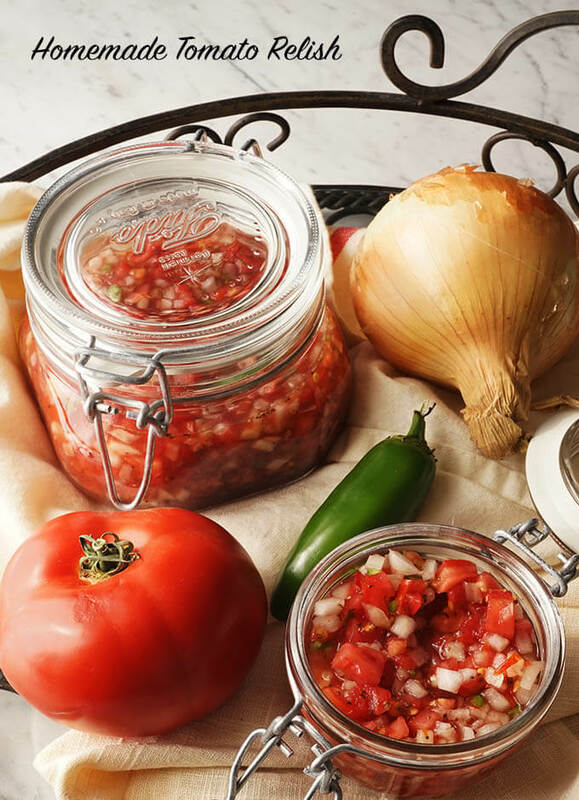 Fresh tomatoes, onions and peppers combine with delicious pickling ingredients to become a fabulous new condiment with bright fresh flavor! Finely dice the tomatoes and onion. Slice the chili pepper in half, remove the ribs and seeds. Finely dice. Mix together all of the ingredients. Pour into a small jar and seal. Let stand for at least an hour. Refrigerate any unused portions. Keeps in the refrigerator up to two weeks. I haven’t used basil with this recipe, but I bet it would be delicious, let me know what you think Rosii, enjoy! Thank you Aimee, it was such a pleasure sharing my Great Grandma’s recipe with Healing Tomato. When I found this recipe, I thought for about two seconds and messaged Rini to see if I could share it here first. The BEST choice and it’s so delicious, I hope you enjoy it! Thank you, Aimee. She is very talented and I love all her recipes. Giving it a 5 star even before I make it because I know it will be delicious no matter how you use it…..can’t go wrong with this….. Thank you so much for sharing this delicious recipe with your readers! I have to say it’s just one of my favorite flavors now and I hope you enjoy it as much as we do, thank you again! !